The city of Hayward is putting earnest money down on plans to make more affordable housing available for its lowest-income residents. On Tuesday, the city council approved $28.6 million to construct three affordable housing developments on what are now vacant lots. The projects, which will be handed off to two non-profit developers, will include 259 new apartments for low and extremely low income residents. “Based on the overall timeline, we're looking to complete construction in 2021,” said Christina Morales, Hayward's housing division manager, noting that all three projects will take about a year to build. Of the new units, 57 will be reserved for people who are currently homeless, with half of those designated specifically for homeless veterans, she added. Funding for the projects comes primarily from a county housing bond as well as fees paid by developers who choose not to include below-market units in their projects. Additional money is expected to come from state and federal tax credits. Like many Bay Area cities, Hayward has long struggled with a major shortage of affordable housing and an increasing homeless population. There were roughly 300 unsheltered homeless people in the city, according to Alameda County's most recent point-in-time count from 2017. About half of them are considered chronically homeless (living continuously on the street for more than a year). Meanwhile, Hayward's housing stock has grown slowly—an average of about 200 new units per year, failing to keep pace with the city's fast growing population, which recently topped 160,000. The bulk of the new funding, $24 million, will go toward a supportive housing complex, a place where services are provided side-by-side with housing. The complex will include 126 micro-units. Each apartment will be 240 square feet and include a bathroom, kitchenette and a pull-out bed—just enough space for one person. The complex, which will be located on Depot Road near the city's Mt. Eden neighborhood, will also include several indoor and outdoor community spaces and direct connections to social service providers. A quarter of the Depot Road units will be reserved for people who are currently homeless, another quarter for disabled residents and the remaining half for very low-income individuals—people generally earning less than $15,000 a year, said Chicoine, with all applicants subject to a strict verification process. Most residents will be single adults, and the average monthly rent is expected to be somewhere between $250 and $300 per unit. “Like most cities in the Bay Area, Hayward has a horrible homeless problem, and it's pretty clear that the answer is creating supportive housing,” Chicoine said. 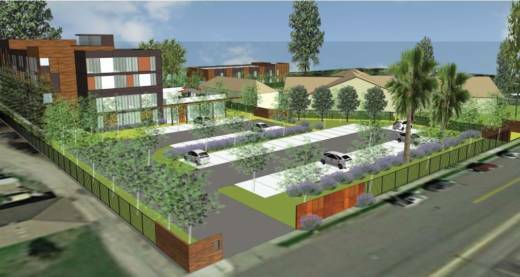 The Depot Road project, he said, will have a similar design as Abode's other supportive housing complexes in Alameda and Santa Clara counties, with residents guaranteed ongoing housing if they follow the rules and use the services provided. Like most of Abode's other projects, he expects demand to be very high. "We'll be overwhelmed with applications," Chicoine said, noting that Abode received 6,000 applications for a total of 63 units in their recently opened Laguna Commons development in Fremont. Chicoine also points out that it's typical for some neighbors to be leery of affordable housing projects like this in their backyards, fearing an increase in crime and vagrancy. "Some neighbors are not excited about having any new housing development," he said. "That’s the Bay Area." But, he adds, housing like this is the most effective way to address what often seems like an intractable homelessness problem.